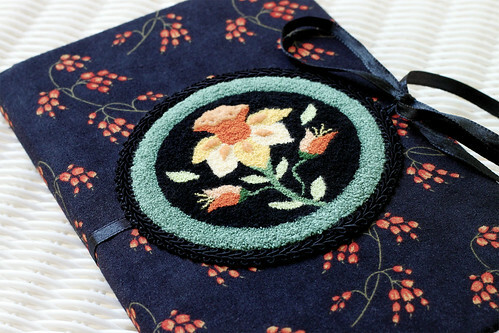 Little trial pieces of needlework are great for adorning things like journals. Here I used my first practice piece of punch-needle embroidery with a bit of calico to cover an inexpensive journal. The cover is slip-stitched in place by hand over the journal. This entry was posted on Friday, September 4th, 2009 at 3:00 am and is filed under Embroidery and Needlework. Tagged: Embroidery, Needlework, Punchneedle. You can feed this entry. You can leave a response, or trackback from your own site. What else could I use finished punch needle projects for? It looks fun but I’m not sure what I would do with it all….. I love what you did with your needle punch piece. You are blessed with a lot of patience!!! Beautiful job! Your students are fortunate to have you as an instructor. Wishing you a good holiday weekend & we hear the wildfires are coming under control…good news.